When you find the perfect watch, it's important that it fits you perfectly. Sometimes, it will be necessary to remove links from the watch band in order to get an exact fit. Read the following article to learn how to remove watch band links in order to tailor any watch to the specifications of your wrist. 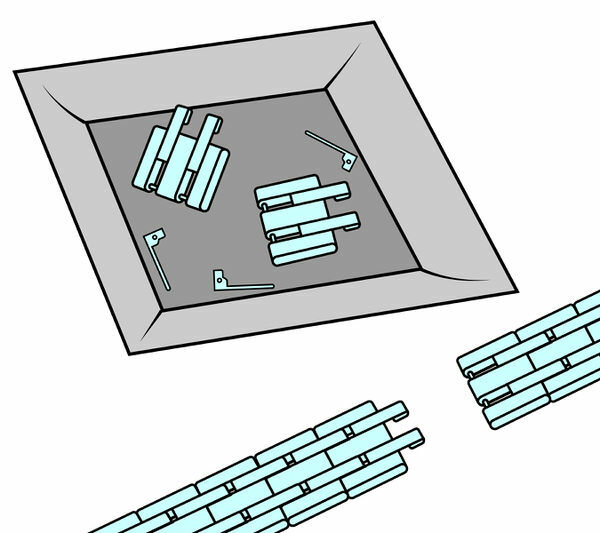 Before you set about removing any watch links, it is necessary to measure your watch band so you know exactly how many links you will need to remove. 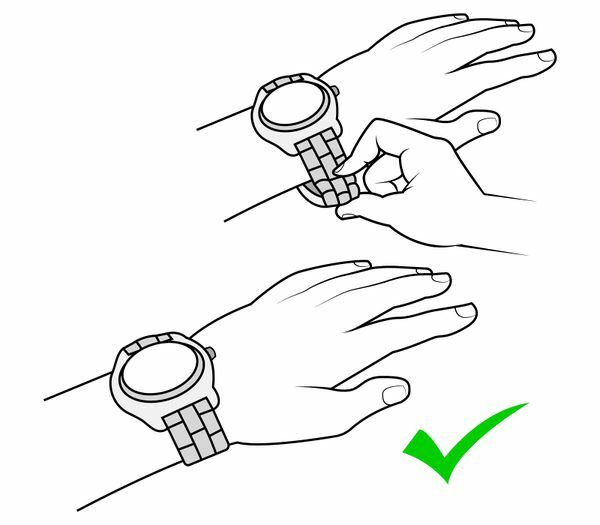 To do this: Position the watch on your wrist exactly the way you intend to wear it. When you are satisfied with the way it is positioned, turn your wrist over so that the watch band clasp side is facing up. 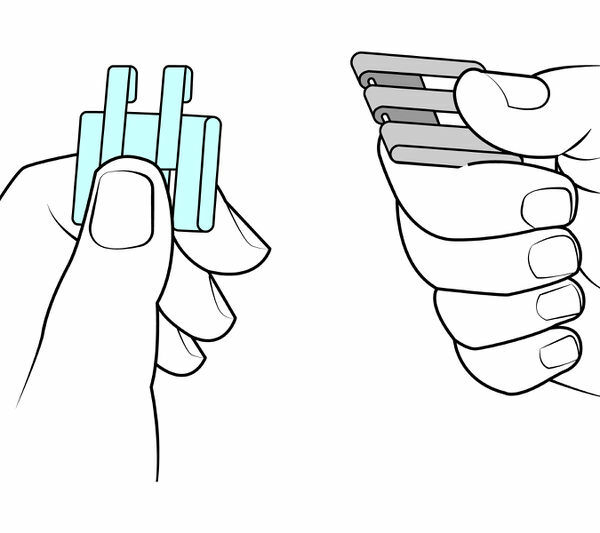 With the watch band on your wrist, gather the slack in the band and hold the links together to simulate them being removed. Stop gathering the links up when the watch band fits your wrist just the way you like. Look where the links are gathered close together at your wrist – be aware that because of the design of the watch band they may not touch. The loose hanging links will tell you the number of links you should remove first. If you can't accurately judge the number of links to remove, remove one less than you expect - it is always easier to remove another link than add one back in. Be aware that it is always better to remove an even number of watch links. 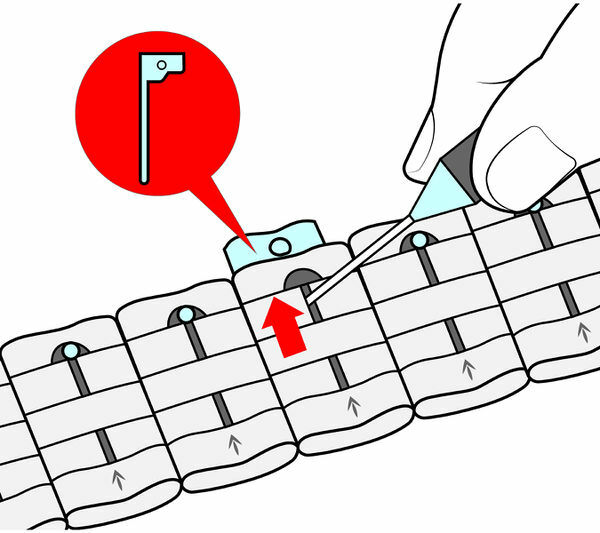 This way, you can remove the same number of links from each side and ensure that the clasp is still located in the center of the watch strap. In order to remove watch links properly, you will need certain tools. These may include: A thin, pointy object like a spring-bar removal tool or pin pusher. A long-nosed pliers. A small hammer. A screwdriver. A parts tray. Make sure that your work area is free from clutter. It is probably a good idea to put down a sheet or some other covering on your work surface and possibly the floor. This is to make sure that any small pieces won't get lost. 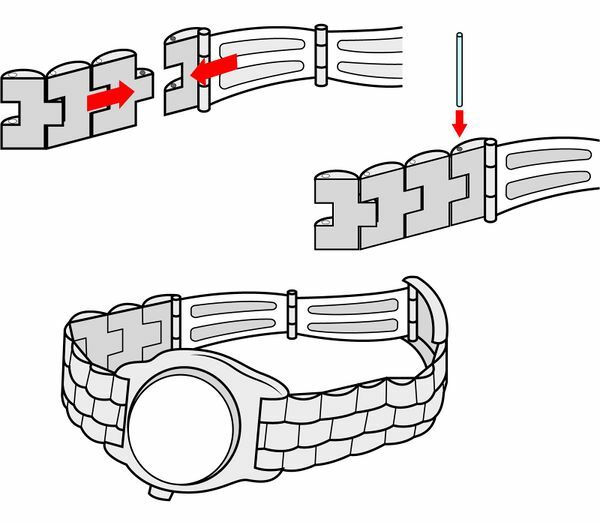 With some metal watch straps, it is necessary to separate the bracelet before you can remove any links. To do this: Remove the spring bar from the watch strap clasp. 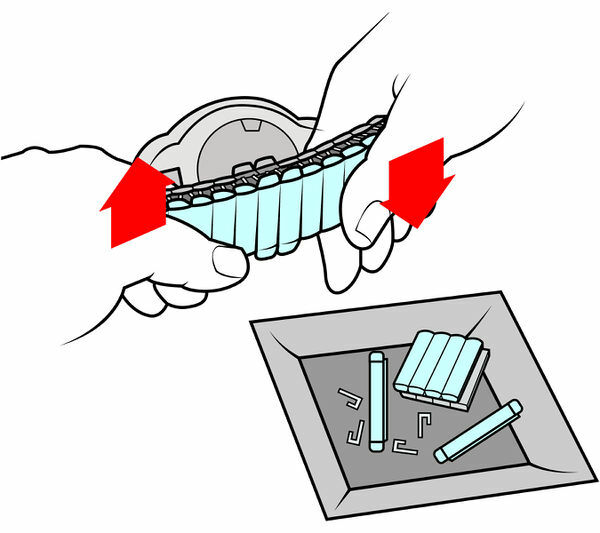 To identify which spring bar it is, hold the clasp in your left hand, and it will be the one on the left side. Use the spring bar removal tool or pin pusher to compress the spring bar and lever it out of the clasp. Be careful that it doesn't spring across the room, because this is the only one you have! 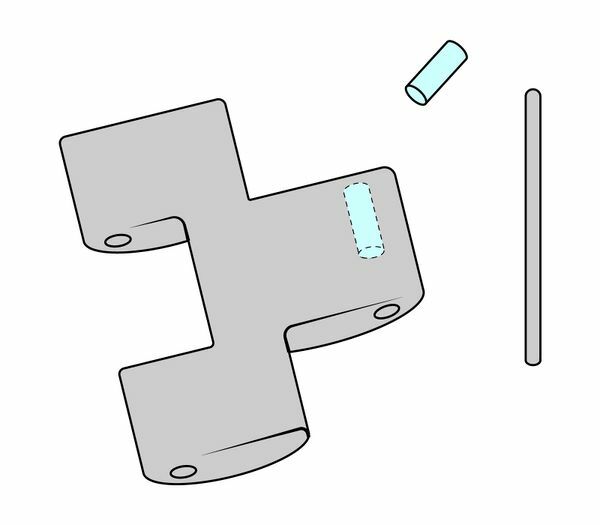 Use the pin pusher or spring bar removal tool to push the pin that secures that particular link, following the direction of the printed arrows on the underside of the metal link. 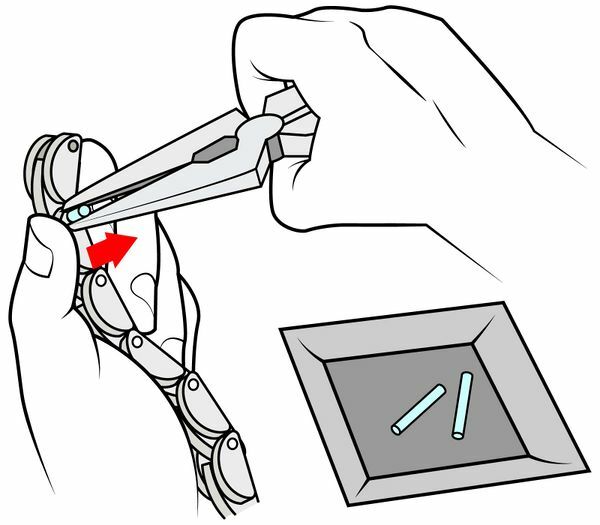 You should be able to push the pin 2 or 3mm and then pull it out from the other side using your pair of pliers or by hand. 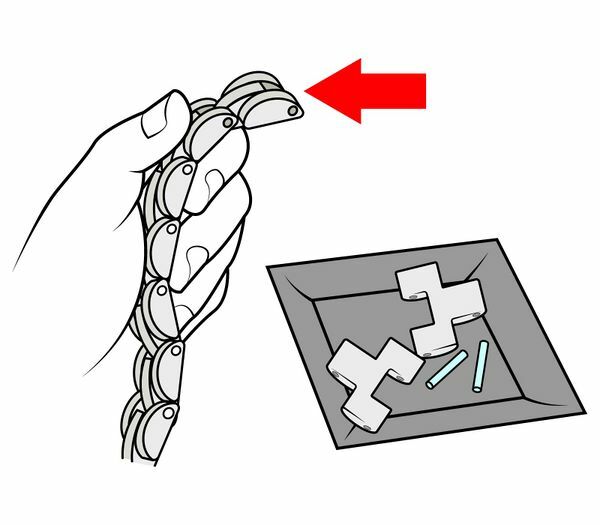 Place the pin in your parts tray, you will need it to put the bracelet back together again. Some watch bands contain small metal ferrules in the middle of joining links that will be released when you take out a pin. It may fall onto the floor or work station, so keep an eye out for it. You will need it later. Repeat the pin removal process on the link's other pin. When you have finished, you should have two pins and possibly two ferrules ready to use later. If you need to, remove another link on the other side of the clasp, using the same process. When you have removed as many links as you need to, you are ready to join the bracelet back together. Once the required links have been removed the pin will need to replaced into the band to complete it again. To do this replace the pin in the opposite direction to the arrows. 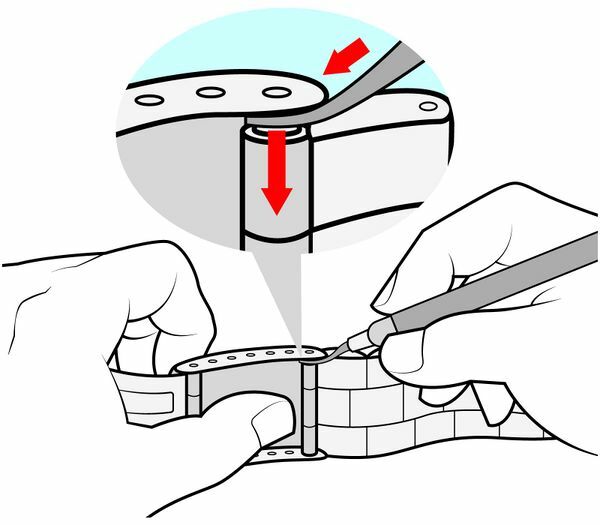 If your watch band has ferrules, place the ferrule in the middle of the link that you are joining up, and when you push the pin back into the hole, make sure to engage the ferrule. If you need to, you can gently tap the pin back into place using your small hammer. 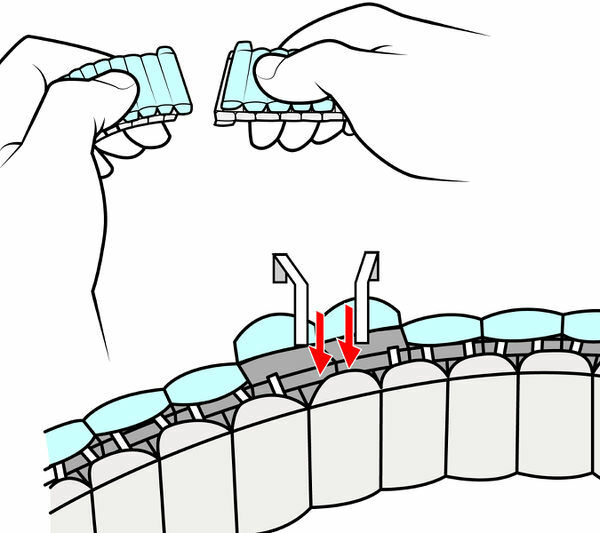 To reconnect the clasp, you need to do the reverse of the disconnecting process. 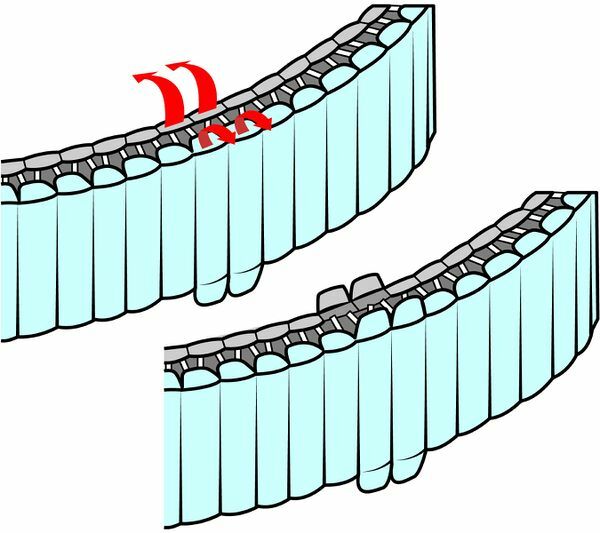 Ensure that the clasp is the right way round and replace the spring bars. Your watch should now fit, if you have removed the correct number of links. If it is still too big, you can always remove another link. If it is a little loose or a little tight, it may be possible to further adjust the bracelet by inserting the clasp's spring bars into an alternative set of holes to adjust the size. Make sure to keep any extra links and spare pins or ferrules safe, you may need to use them again in the future. Turn the watch on its side, find the link you wish to remove and locate the screw holding it in place. Use a 1mm screwdriver to remove the required screw. 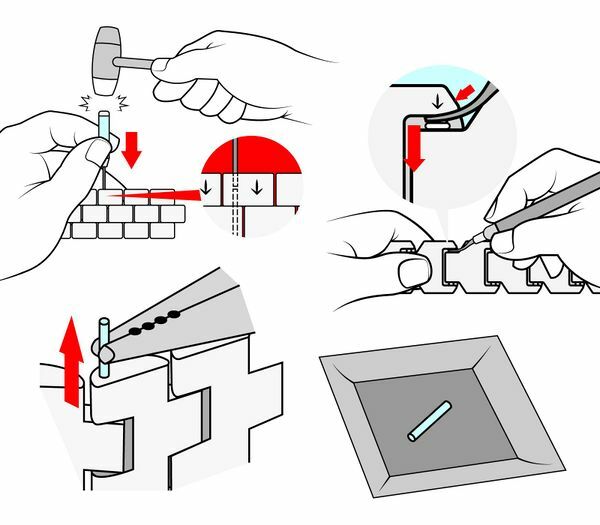 You can do this by applying light pressure and turning the screwdriver in a counterclockwise motion. Continue to turn in a counterclockwise motion until the screw becomes loose. 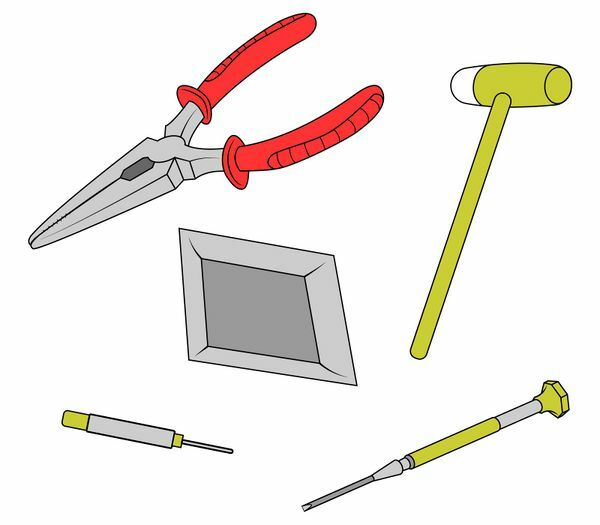 Use a pair of tweezers or pliers to grab the screw before it falls. 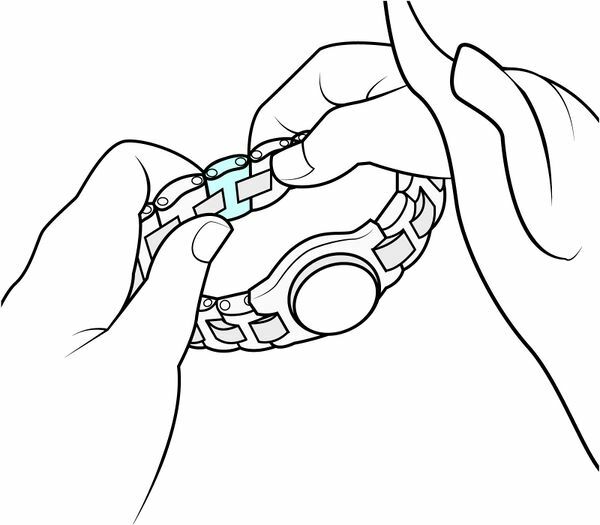 Make sure to keep it somewhere safe, as you will need it to reassemble the watch. 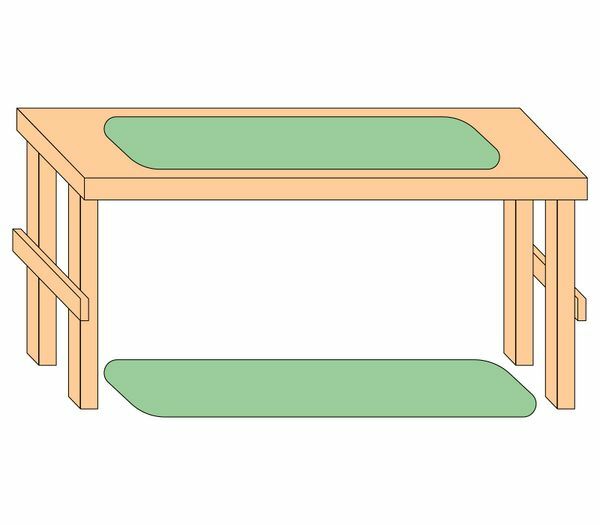 Ensure that you do this over a table or tray to make sure you don't lose screws should they fall during the process. 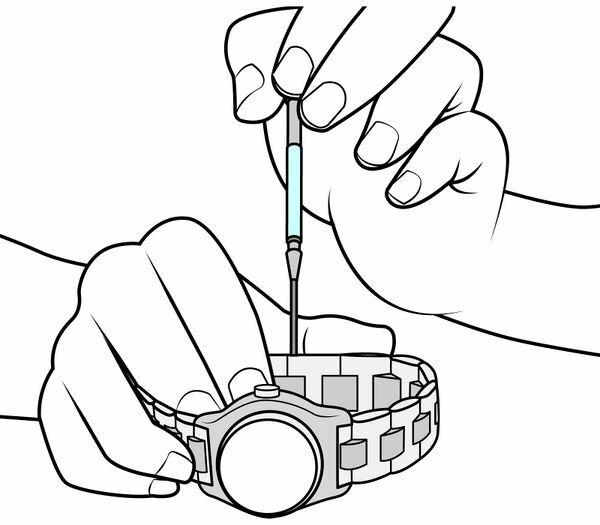 Once the screw has been removed, your chosen link can easily be separated from the watch band. Repeat this process for each link that you need to remove. 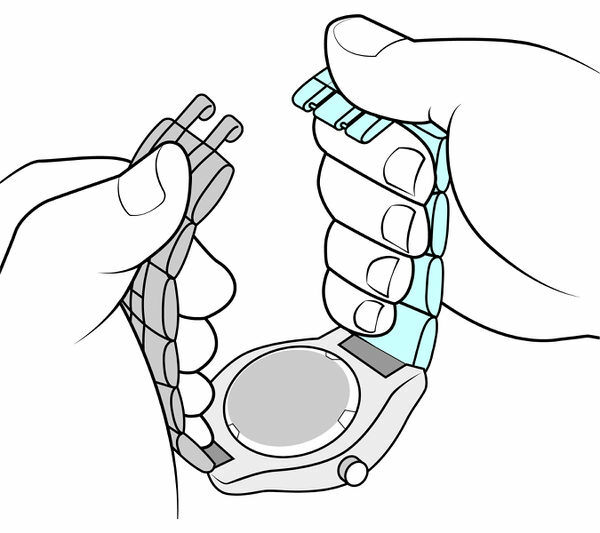 Once you have removed the necessary number of links, you can reassemble your watch band by simply reconnecting the links using the removed screw and a screwdriver. You can do this by attaching one end of the watch strap to its case, then wrapping the strap around your wrist. Count how many of the links are overlapping and add one to this number. The number you come with is the number of links that will need to be removed. With this kind of watch band, you can easily remove links from any part of the band. Place the watch face down on your work surface and bend down the top edge flaps of the section you intend to remove. 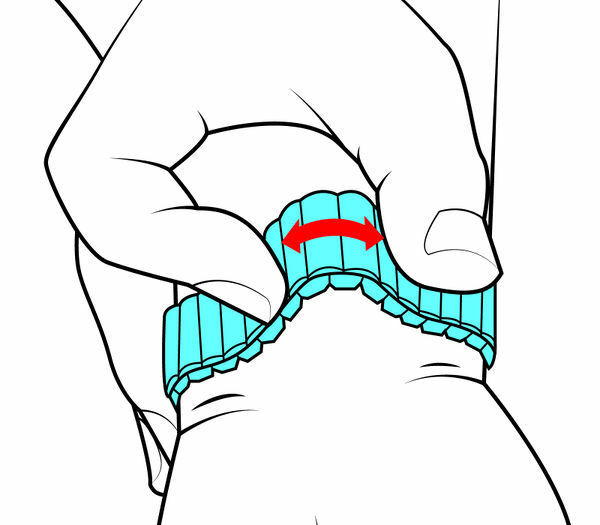 Flip the watch over and snap open the bottom edge flaps. These are located directly to the left of the top flaps you opened already. Take the link out by sliding the section you wish to remove sideways. This will automatically disengage the staples which hold the links together. 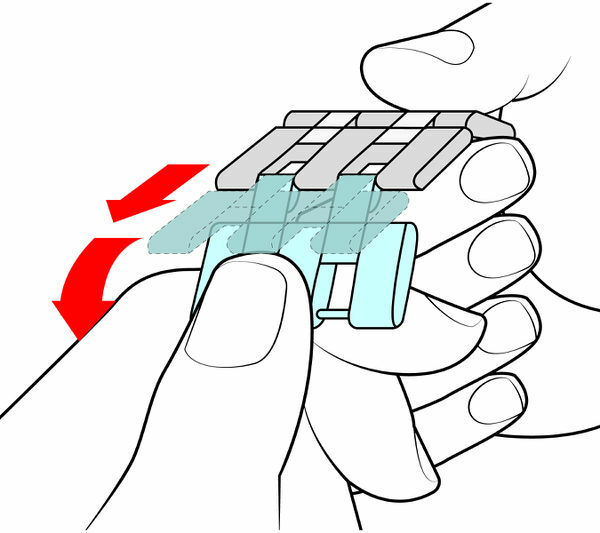 To do this, you will need to engage the staples on both sides of the strap at the same time, before snapping all of the flaps back into place. Using a pin pusher, remove the pin from the link you wish to remove. Make sure you follow the direction of the arrow marked on the underside of the link. 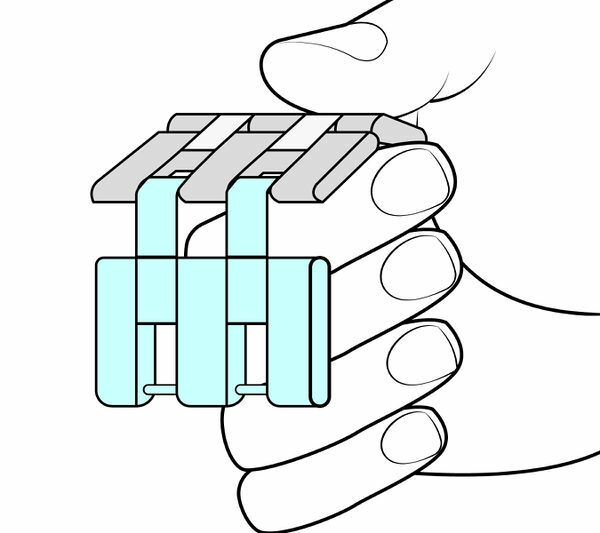 Hold the band firmly, with one hand on either of the link whose pin you just removed. 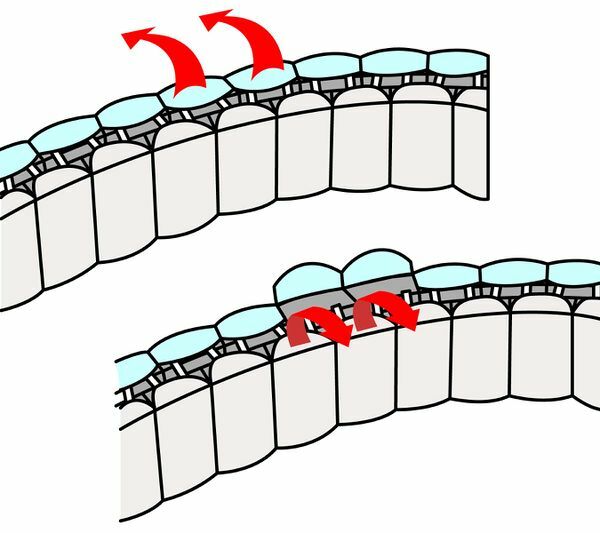 Gently apply an upward pressure on the side of the link which is closest to the case. 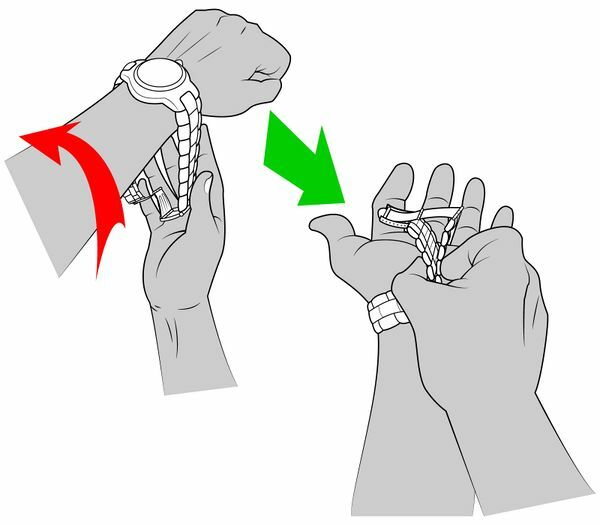 At the same time, apply a gentle downwards pressure on the side nearest the clasp. You should be able to feel the mechanism disengaging. 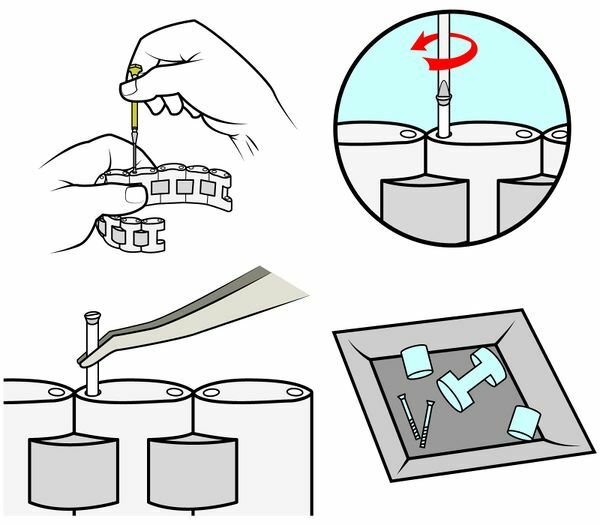 Keep applying gentle pressure as you gently "rock" the band to complete the mechanism's release. When the mechanism has been released, you can take the links apart by moving the clasp side of the strap towards the case. Once the links have been disengaged, you will be able to pull the links apart. Try to do this as gently as possible. Repeat for as many links as necessary. 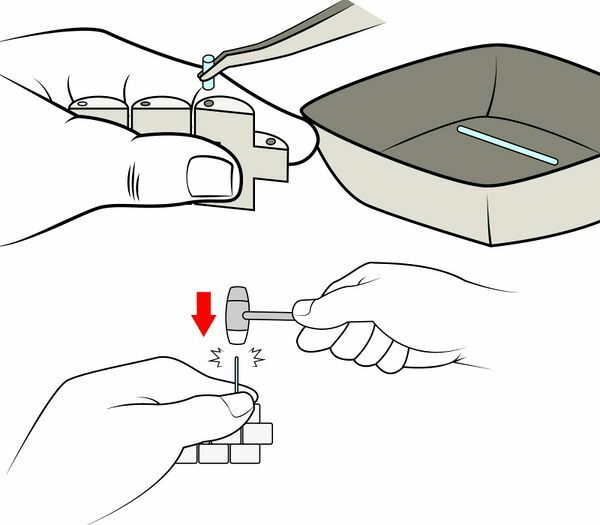 To reassemble the watch, simply follow the sames steps as above, but in reverse.